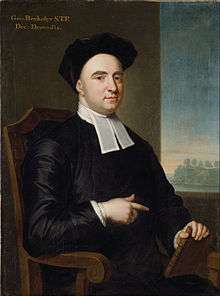 George Berkeley (/ˈbɑːrklɪ/; 12 March 1685 – 14 January 1753) — known as Bishop Berkeley (Bishop of Cloyne) — was an Irish philosopher whose primary achievement was the advancement of a theory he called "immaterialism" (later referred to as "subjective idealism" by others). This theory denies the existence of material substance and instead contends that familiar objects like tables and chairs are only ideas in the minds of perceivers, and as a result cannot exist without being perceived. Berkeley is also known for his critique of abstraction, an important premise in his argument for immaterialism. 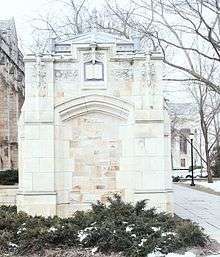 The Berkeley portion of the Yale Campus is named after George Berkeley. In this book, Berkeley's views were represented by Philonous (Greek: "lover of mind"), while Hylas (Greek: "matter") embodies the Irish thinker's opponents, in particular John Locke. Berkeley argued against Sir Isaac Newton's doctrine of absolute space, time and motion in De Motu (On Motion), published 1721. His arguments were a precursor to the views of Mach and Einstein. In 1732, he published Alciphron, a Christian apologetic against the free-thinkers, and in 1734, he published The Analyst, a critique of the foundations of calculus, which was influential in the development of mathematics. Berkeley was born at his family home, Dysart Castle, near Thomastown, County Kilkenny, Ireland, the eldest son of William Berkeley, a cadet of the noble family of Berkeley. He was educated at Kilkenny College and attended Trinity College, Dublin, earning a bachelor's degree in 1704 and completing a master's degree in 1707. He remained at Trinity College after completion of his degree as a tutor and Greek lecturer. In 1728, he married Anne Forster, daughter of John Forster, Chief Justice of the Irish Common Pleas. He then went to America on a salary of £100 per annum. He landed near Newport, Rhode Island, where he bought a plantation at Middletown – the famous "Whitehall". It has been claimed that "he introduced Palladianism into America by borrowing a design from [William] Kent's Designs of Inigo Jones for the door-case of his house in Rhode Island [Whitehall]". He also brought to New England John Smibert, the British artist he "discovered" in Italy, who is generally regarded as the founding father of American portrait painting. Meanwhile, he drew up plans for the ideal city he planned to build on Bermuda. He lived at the plantation while he waited for funds for his college to arrive. The funds, however, were not forthcoming, and in 1732 he left America and returned to London. He remained at Cloyne until 1752, when he retired and went to Oxford to live with his son and supervise his education. He died soon afterward and was buried in Christ Church Cathedral, Oxford. His affectionate disposition and genial manners made him much loved and held in warm regard by many of his contemporaries. In his Essay Towards a New Theory of Vision, Berkeley frequently criticised the views of the Optic Writers, a title that seems to include Molyneux, Wallis, Malebranche and Descartes. In sections 1–51, Berkeley argued against the classical scholars of optics by holding that: spatial depth, as the distance that separates the perceiver from the perceived object is itself invisible; namely, that space is perceived by experience instead of the senses per se. In 1707, Berkeley published two treatises on mathematics. In 1734, he published The Analyst, subtitled A DISCOURSE Addressed to an Infidel Mathematician, a critique of the Calculus. Florian Cajori called this treatise "the most spectacular event of the century in the history of British mathematics." However, a recent study suggests that Berkeley misunderstood Leibnizian calculus. The mathematician in question is believed to have been either Edmond Halley, or Isaac Newton himself—though if to the latter, then the discourse was posthumously addressed, as Newton died in 1727. The Analyst represented a direct attack on the foundations and principles of calculus and, in particular, the notion of fluxion or infinitesimal change, which Newton and Leibniz used to develop the calculus. Berkeley coined the phrase ghosts of departed quantities, familiar to students of calculus. Ian Stewart's book From Here to Infinity, (chapter 6), captures the gist of his criticism. Berkeley did not doubt that calculus produced real world truth; simple physics experiments could verify that Newton's method did what it claimed to do. "The cause of Fluxions cannot be defended by reason", but the results could be defended by empirical observation, Berkeley's preferred method of acquiring knowledge at any rate. Berkeley, however, found it paradoxical that "Mathematicians should deduce true Propositions from false Principles, be right in Conclusion, and yet err in the Premises." In "The Analyst" he endeavoured to show "how Error may bring forth Truth, though it cannot bring forth Science." Newton's science, therefore, could not on purely scientific grounds justify its conclusions, and the mechanical, deistic model of the universe could not be rationally justified. In A Discourse on Passive Obedience, Berkeley defends the thesis that people have “a moral duty to observe the negative precepts (prohibitions) of the law, including the duty not to resist the execution of punishment.” However, Berkeley does make exceptions to this sweeping moral statement, stating that we need not observe precepts of “usurpers or even madmen” and that people can obey different supreme authorities if there are more than one claims to the highest authority. One may view Berkeley’s doctrine on Passive Obedience as a kind of ‘Theological Utilitarianism’, insofar as it states that we have a duty to uphold a moral code which presumably is working towards the ends of promoting the good of humankind. However, the concept of ‘ordinary’ Utilitarianism is fundamentally different in that it “makes utility the one and only ground of obligation”—that is, Utilitarianism is concerned with whether particular actions are morally permissible in specific situations, while Berkeley’s doctrine is concerned with whether or not we should follow moral rules in any and all circumstances. Whereas Utilitarianism might, for example, justify a morally impermissible act in light of the specific situation, Berkeley’s doctrine of Passive Obedience holds that it is never morally permissible to not follow a moral rule, even when it seems like breaking that moral rule might achieve the happiest ends. Berkeley holds that even though sometimes, the consequences of an action in a specific situation might be bad, the general tendencies of that action benefits humanity. Other than philosophy, Berkley also influenced modern psychology with his work on John Locke's theory of association and how it could be used to explain how humans gain knowledge in the physical world. He also used the theory to explain perception, stating that all qualities where , as Locke would call them, secondary qualities therefore perception laid entirely in the perceiver and non in the object. These are both topics today studied in modern psychology. The University of California, Berkeley was named after him, although the pronunciation has evolved to suit American English: (/ˈbərkliː/ BURK-lee). The naming was suggested in 1866 by Frederick Billings, a trustee of the then College of California. Billings was inspired by Berkeley's Verses on the Prospect of Planting Arts and Learning in America, particularly the final stanza: "Westward the course of empire takes its way; The first four Acts already past, A fifth shall close the Drama with the day; Time's noblest offspring is the last." ↑ "Berkeley" entry in Collins English Dictionary, HarperCollins Publishers, 1998. ↑ "John Smibert". Encyclopedia Britannica. Retrieved 15 August 2016. ↑ McCracken, Charles J. and Tipton, Ian, eds., Berkeley's Principles and Dialogues: Background Source Materials. Cambridge: Cambridge University Press, 2000, p. 5 (The editor's Introduction). McCracken, Charles J. and Tipton, Ian, eds., Berkeley's Principles and Dialogues: Background Source Materials. Cambridge: Cambridge University Press, 2000, p. 6 (Editor's Introduction). Walmsley, Peter (1990). The Rhetoric of Berkeley's Philosophy (PDF). Cambridge: Cambridge University Press. Downing, Lisa. "George Berkeley". Stanford Encyclopedia of Philosophy.